Slovakia is landlocked republic in central Europe, bounded on the northwest by the Czech Republic, on the north by Poland, on the east by Ukraine, on the south by Hungary, and on the southwest by Austria. Bratislava is Slovak capital and largest city. Bratislava Airport to Trencin: 120 km. Vienna Airport to Trencin: 170 km. How to get to Trencin, Slovakia? If you are flying by airplane, get to any of the above mentioned International Airports. Check your bus or train connection from any European city to Trencin here ! Directly from the Prague Airport it is possible to take flight to Sliac where is our second office located - we can meet here too. Get from the Airport to Prague City (very historic and not expencive) and take either bus or train to Bratislava, or directly to Trencin where I can pick you up from the bus/railway station. There are plenty of regular connections from Prague to either Bratislava or Trencin. Rent a car - route: Praha, Brno, (Bratislava), Trencin. IMPORTANT: Type "PRAHA" to from field ! Go to Budapest city (very nice historic city). There are many more train connections ( leaving from "Budapest-Nyugati pu. ", "Budapest-Kelenföld") than bus connections (leaving from "Budapest, Népliget aut.áll.") to Bratislava, Zvolen (close FS office in Sliac), or even directly to Trencin. We can meet either in Trencin or Sliac (close to Zvolen town). Rent a car and ride to Trencin or Sliac (much closer from Budapest). We can meet either in Trencin or Sliac (close to Zvolen town). Directly from the Vienna airport (Schwechat) you can get bus to Bratislava. From Bratislava (Slovak Capital) there are many regular bus and train connections to Trencin. Also you can rent a car in Bratislava (it will be probably cheaper than in Vienna) and arrive by car. There is a highway leading directly from Bratislava to Trencin, direction Zilina. Go to Vienna city to look around (very nice historic city). There are many regular train (leaving from "Wien Südbahnhof", "Wien Nord", "Wien Westbahnof") and some bus connections to Bratislava or Brno as well. You can rent a car and ride to Trencin, although I think that it would be cheaper to rent a car in Bratislava. Get bus or taxi to Bratislava city. There are plenty of regular bus (leaving from Bus station - "AS Nivy") and train connections (leaving from Bratislava Main Station - "Bratislava Hlavna Stanica") to Trencin. Just take one and I will pick you up at Trencin bus/train station. Rent a car and drive by highway to Trencin. Get to the town center. Where are we in Trencin? There is a highway leading from Bratislava directly to Trencin, direction ZILINA. 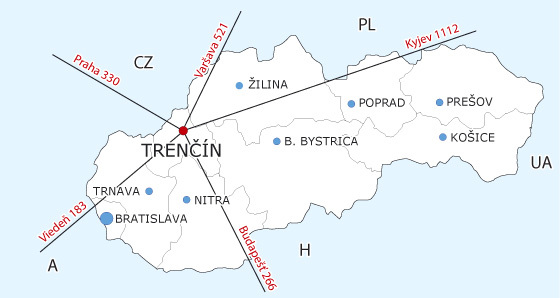 When you will be in TRENCIN, always take direction to the center "CENTRUM", ŽILINA", or VYSTAVISKO (it is the same way). In the town center, at at bigger crossing with trafic lights, with CASTLE and hotel TATRA on your right, and FUTBALL stadium on your left (you will see the big lights over it), take the direction SIHOT (left). You will be passing by this futball summer stadium and after appr. 1 km there will be WINTER hall called "ZIMNY STADION" on your left and Magnus Hotel and shopping center on your right hand. In front of it you will see a parkplace, so park there and call me . I will pick you up from there within 15 minutes. In case you have difficulty to find the winter hall - "Zimny Stadion", park in the Trencin town center and call me. I will pick you up within 40 minutes. Please, arrange the meeting in beforehand by email so that we won't miss each other: info@fujara.sk or phone: +421-911543211 - Tomas Kovac.